Bianchi, F.; Kunusch, C.; Ocampo-Martinez, C.A. ; Sánchez, R.S. 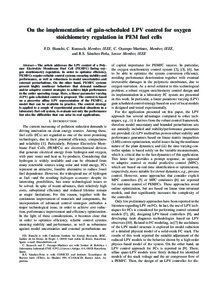 The article addresses the LPV control of a Polymer Electrolyte Membrane Fuel Cell (PEMFC) facing oxygen stoichiometry regulation. In order to optimize efficiency, PEMFCs require reliable control systems ensuring stability and performance, as well as robustness to model uncertainties and external perturbations. On the other hand, PEMFC systems present highly nonlinear behaviors that demand nonlinear and/or adaptive control strategies to achieve high performance in the entire operating range. Here, a linear parameter varying (LPV) gain scheduled control is proposed. The control is based on a piecewise affine LPV representation of the PEMFC, a model that can be available in practice. The control strategy is applied to a couple of experimental practical situations in a laboratory fuel cell system, to evaluate not only the performance but also the difficulties that can arise in real applications. Bianchi, F.D. [et al.]. On the implementation of gain-scheduled LPV control for oxygen stoichiometry regulation in PEM fuel cells. A: IEEE Conference on Decision and Control. "Proceedings of the 2013 IEEE 52nd Annual Conference on Decision and Control: CDC 2013: December 10-13, 2013: Florence, Italy". Florència: Institute of Electrical and Electronics Engineers (IEEE), 2013, p. 990-995.